Additional space for exhibiting the museum's artworks; more room for educational and other programs; an improved dining experience; a greatly expanded and enhanced regional cultural institution. For the Denver Art Museum: to enlarge its facility to accommodate its growing art collection and program list; for the City & County of Denver: to create another landmark cultural attraction. Dynalectric Company of Colorado had to adjust to continual changes that effectively doubled the size of the original scope of work and pushed the completion date back almost six months. In the course of the project, Dynalectric had to deal with trade stacking and scaffolding matters. It also had to coordinate mechanical, electrical, and plumbing activities and resolve conflicts, as well as work through GPS layout and structural priority issues. The various scheduling changes meant the company's crews had to work in multiple areas simultaneously amidst constantly changing priorities. Tracking document flow and updating file drawings in a timely way was key. In addition, the client needed to occupy certain spaces before the building was completed, so Dynalectric substantially finished and turned over four separate areas early. Much of this occurred in and around the Frederic C. Hamilton Building, a new 150,000-square-foot expansion connected to the existing museum. In this facility, the company installed a 450-kilowatt generator, main power and distribution systems, 4,000-ampere service, and mechanical power connections. In addition, the company provided lighting, lighting control/dimming, fire alarm, and snow melt systems along with conduit/cable tray channels for tele/data, security, and low-voltage systems. The company also contributed to the project's site development efforts by putting in the distribution system, branch circuitry and its associated devices, all site and exterior building lighting and control equipment, and low-voltage system ductbanks and manholes. The new Morgan Wing also required work. Connected to the Hamilton Wing, it includes approximately 15,000 square feet of new public space. Here, the company installed all distribution, lighting, and fire alarm systems as well as low-voltage wiring pathways. Finally, Dynalectric oversaw demolition and re-work in Palettes, the museum's restaurant. In addition to distribution and lighting equipment for this full-service kitchen, the company installed fire alarm and life safety systems. The largest art museum between Kansas City and the West Coast, the Denver Art Museum contains more than 55,000 works of art, including a well-known collection of American Indian art and the only Asian art collection in the Rocky Mountain region. Other holdings consist of works by some of the greatest names in art, including Degas, Matisse, Monet, O'Keefe, Picasso, Remington, and Warhol. The internationally renowned architect Daniel Libeskind designed the new Hamilton Wing. 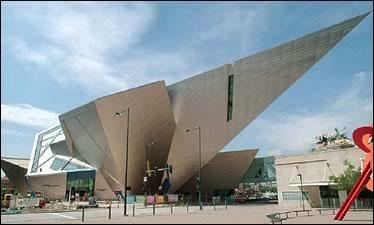 Drawing inspiration from the Rocky Mountain's peaks and geometric rock crystals, Libeskind covered the building with 9,000 titanium panels that reflect the Colorado sun.